Tonight God put up a glorious sky, filled with rainbows and light. 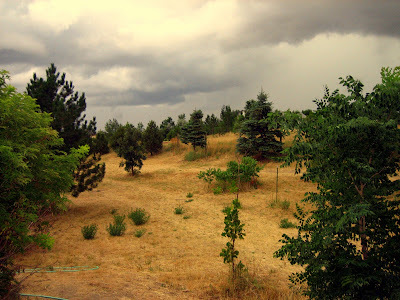 Here is a picture looking south from our front yard. 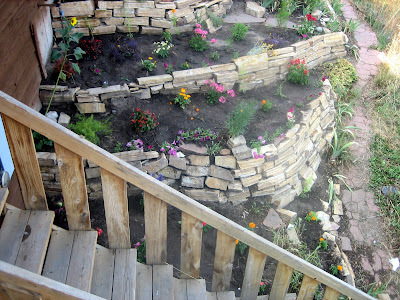 The fourth tier of the garden is done. 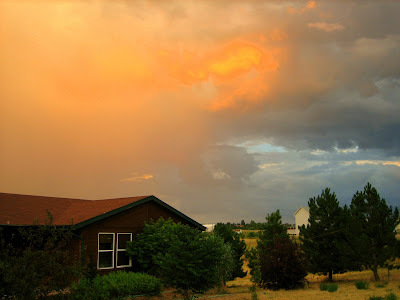 Last night a big electrical storm approached the house from the southeast, but then veered to the north and missed us. Lightnig was all over the sky, so I tried to capture it, even though my camera battery was failing. This is a view of the lightning storm looking south from our front porch. Here is a new foster care story. Our neighbors across the street in Golden had two teen daughters. I have previously referred to the family affectionately as the redneck family in our block. Each of the teens repeatedly got pregnant and had babies. Between the two of them, there were six babies by the time the family left due to foreclosure. Both s got involved with illegal immigrants from Mexico. The last one broke bones in the teen's infant daughter's legs and ribs, and fractured her skull. These incidents happened over several months of time. The grandma called me today to proudly announce that she has been awarded temporary custody, while the daughter undergoes a series of classes and tests. 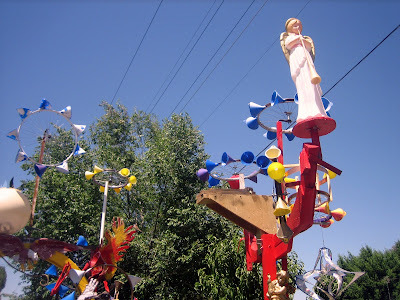 The sonofabitch who did this to the little has been deported back to Mexico. I wonder how long it will be before he is back in the United States. 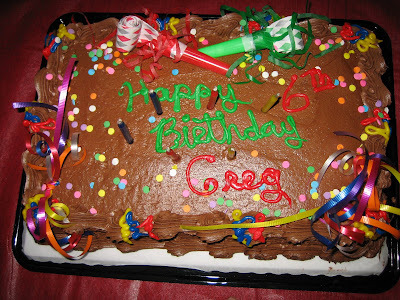 Here is the cake that rapidly disappeared as we celebrated Greg's sixth birthday two nights ago. 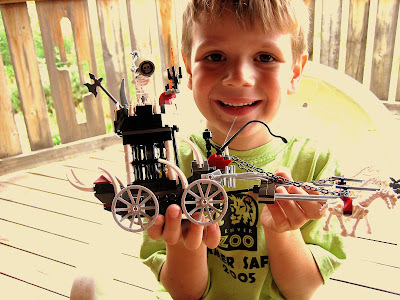 Birthday boy six-year-old Greg created this castle/carriage with Legos he got for his birthday two days ago. He told me that it took one hour to put together, and he could not wait to show it to me when I got home tonight. Greg has real stick-to-itness, and loves art. It will be a joy to teach him again this year as he enters first grade. Roar, Zoom! Shock and Awe! One of the really cool things about our new country living is that we are near Buckley Air Force Base in Aurora and also not too far from the U.S. Air Force Academy. Fighter jets roar across the sky throughout the day. We are also near Denver International Airport's south runways, so we get those jets taking off and arriving. But it is the military jets that I particularly enjoy. Go get em, guys and gals! Mother-in-law is here, so Colleen and I actually got to enjoy a half-moonlight horseback ride tonight. Coming back we could see the whole front range of the Rockies. Very relaxing, and the first time we did something alone together in months. I showed Colleen all the encouraging comments you all have written about my idea to write a book on foster care from the perspective of foster parents. Her idea for a title: "Yours, Mine, Ours, and Theirs"! She especially liked MizzE's prediction that we would sell a ton of books, and asked, "Then we could quit doing foster care?" Thanks for the comments on the last post. 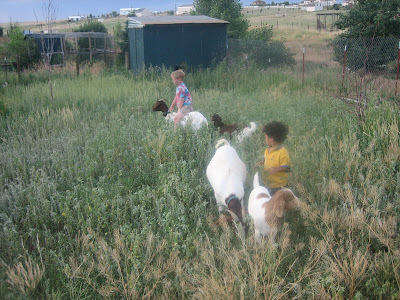 I hope you all will not mind if I write more here in blogger about foster care experiences. That way all the posts get saved, and I can go back through some day to pull it all together in a book. Occasionally we go to meetings of foster parents. It is so cool to see the love these people give to the children in their care. I think of one crusty old truckdriver dude who just melts when his foster daughter cuddles up in his lap in the meetings. The private agency that licensed us has done a good job of recruiting black and Hispanic foster parents, too. Many of them are extra savvy about the real world. They know what it is going to take for the children to learn the skills they need to make it in life. They know the lies, the phonies, the stigma. But, as Jungle Mom says, we all have to keep fighting the good fight. People are counting on us. Go here to watch and listen to Ella Fitzgerald's flawless rendition of "It's Summertime." Or, if you want more soul, but less perfection, stay there long enough to hear the same tune played by Big Brother and The Holding Company, featuring Janis Joplin. 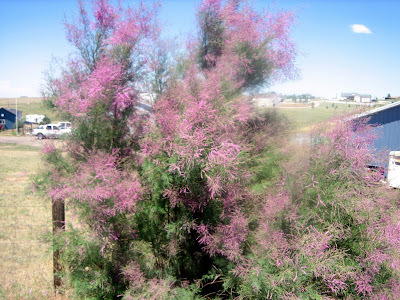 This tree with purple blooms is located at our front gate. I love it! Anyone know its name? 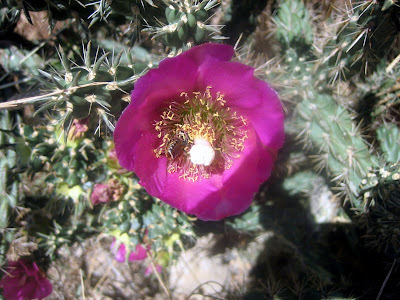 This morning's inspiration was to clean out all the weeds from a cactus garden in the front of the house. I got the last weed just as the sun started bearing down. The garden is on the west side of the house, and the sun hits there about 11:30 and bakes away all the rest of the day. 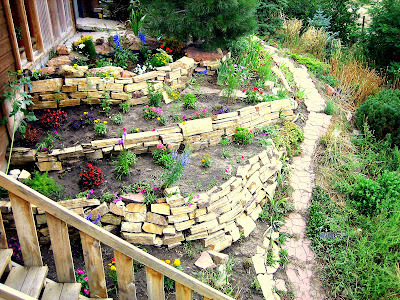 I'm thinking I will just plant some petunias and other shallow bedding plants, then throw in some wildflower seeds in the fall. 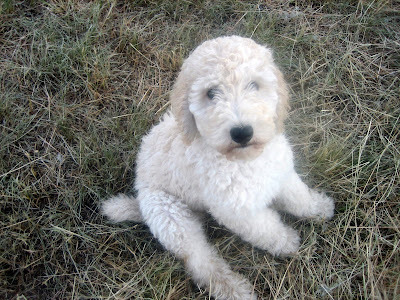 This is Charm, the puppy who got the free ride from pasture to house a couple of nights ago. 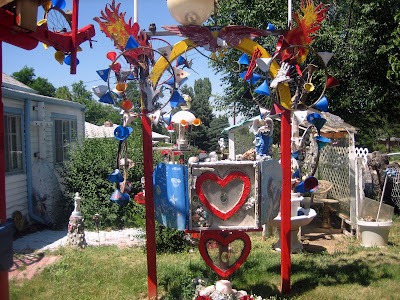 If you are feeling a little depressed, just take a virtual drive over to this house in Denver! Puppies Have To Obey Rules, Too! Puppy gets a free ride back to the house. 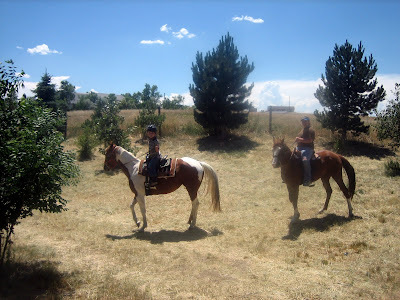 She followed me out to the pasture, where I enjoyed a sunset horseback ride with my sons. The Cook Shack--Gab & Grub is a blog I love to visit. Tonight he brings us a beautiful woman from Utah. See if you don't agree. 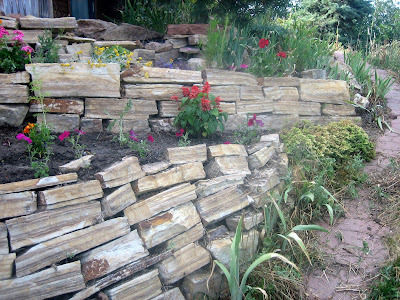 I know that the rocks look like they have been laid by a drunk in places, but that was just the best I could do, and I swear the only medication I am on is Claritin. The weeds and grasses were waist high. Three levels are complete, with one more to go. This is when I first realized we are living in a very different place. I looked out the front window, and there were two of my children on horseback. I apologize for the quality of these photos. My computer is still not working right. 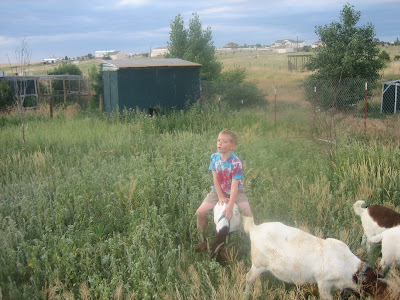 This is a photo of Linebacker Dude and Jon riding the goats on one of our first evenings at the new place. The Mickey Mouse on the barn suitably describes this blogger dude from the city who is trying to pretend to be a rancher! Guess What? We Just Flushed Batman Down the Toilet! Here we all were, sitting at our first real meal in about two weeks. Barbequed Chicken, garlic potatoes, rolls, barbequed beans, applesauce, a three tiered coconut cake, and brownies! The sky is dark, and lightning begins. Thunder is heard. The conversation turns to tornadoes. The rain starts to come down hard: sideways! Just then seven-year-old Jon comes in from the bathroom followed by five-year-old Greg, all excited. Guess what? We just flushed Batman down the toilet! You flushed a toy down the toilet in our new house? Mom and Dad look at each other in horror. Quick-thinking fifteen-year-old son takes Jon by the hand, and they go into the bathroom. Having done similar things many times before, the fifteen-year-old knows just what to do. He requires Jon to reach down into the toilet and retrieve Batman. Jon proudly returns to the kitchen with Batman looking no worse for the experience. After a thorough hand-washing, everyone returns to the less exciting activity of watching the sideways rain come down. Hello friends! We are alive and well out here in the little house on the prairie! I don't know whether we will ever get all the boxes unpacked. We moved everything in U-Haul trucks and trailers. I still have not found the cord that plugs in to post photos, but as soon as I do, I will begin posting them. I could not have imagined how much I would enjoy this country living. The sunrises and sunsets are amazing. Between changing poopy diapers and unpacking a box or two, I have been busy building a terraced garden just outside the kitchen window. The weeds and grasses were waist high and higher. I have been pulling them all by hand to make the garden. We paid the neighbor, who absolutely loves roaring around in his ATV, to mow the grasses and weeds around the first two acres. The outer acre and one-half we have left in the native grases for the horses and goats, and our enjoyment. The last count was one fox with babies, one cat, six dogs, four boar goats, two horses, seven children, and two very exhausted, but very happy parents. 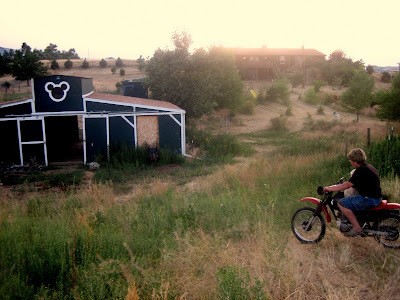 Our fifteen-year-old son has a new Honda dirt bike, and has been busy giving rides to all of the other children, and building a jump course around the outer perimeter of our property. (My job is to enforce the agreed-upon rule that the dirt bike track stays on the perimeter of the property). The house faces west and sits at the top of a hill. The barn is down the hill to the east, then the property goes uphill for the final acre and one-half, so we have a good view from the house of the goings on. Someone, who lived here previously, planted over two hundred trees. As you can imagine, trees are a very precious commodity. I will be diligently watering them and photographing them. 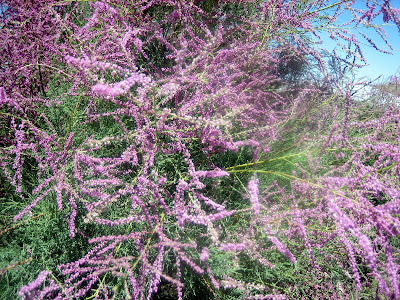 There is a wonderful variety, including two that are an amazing purple! 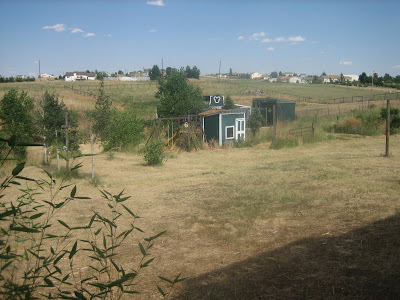 My wife wants to make sure that I am held accountable for my stinky attitude toward the whole concept of moving away from the beautiful city of Golden, Colorado, nestled as it is at the base of the foothills of the Rocky Mountains, and close to all the urban amenities of the Denver metro area. This move was Colleen's life-long dream, and she is deliriously happy. That alone makes the whole move more than worth it to me. Did you see that Hillary has come out on the attack against Fred Thompson? Apparently Fred said in answering a question that some immigrants from Cuba could be terrorists. So Hillary gives a speech at Disneyland in Orlando ridiculing Fred and trying to make him seem anti-Hispanic and anti-Cuban refugee in all-important Florida. It is a brilliant move on Hillary's part, beecause her base doesn't even think there are terrorists in the world, while Fred's base is very invested in securing America against the very real terror threat. It also shows that Hillary is worried about Fred. I don't recall her heretofore singling out any other Republican candidate. Go get her, Fred!